Minnesota-born hornist Victoria Knudtson is an active performer in the Philadelphia area while studying at the Curtis Institute of Music. As the newly appointed hornist of the Saint Louis Brass, Knudtson tours with the group year-round, giving performances and teaching throughout the country. Knudtson also holds the position of 3rd horn in the ensemble Symphony in C.
Knudtson received her bachelor’s degree from the Indiana University Jacobs School of Music, where she studied primarily under Jeffrey Nelsen. She is privileged to have been a 2018 horn fellow at the Pacific Music Festival, an orchestra which tours Japan under the direction of Maestro Valery Gergiev. 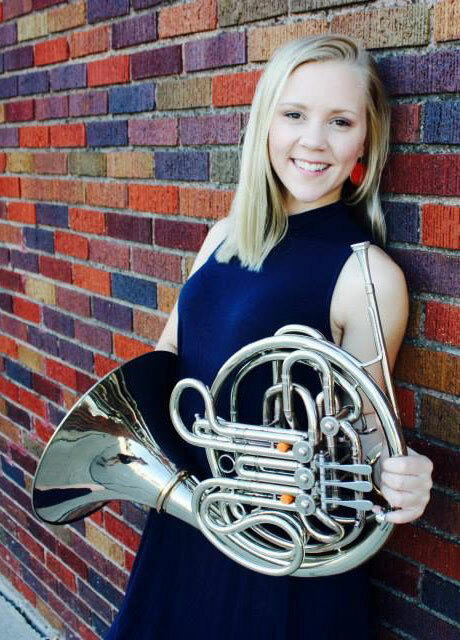 In 2016, Knudtson won the Brass Concerto Competition at Indiana University for her performance of Richard Strauss’ 1st horn concerto. Her teachers include Jeffrey Nelsen, Dale Clevenger, Richard Seraphinoff, Wolfgang Vladar, and Wayne Lu. Victoria was a beneficiary of Kendall Betts Horn Camp as a participant in 2013, 2014, and 2016, and has been giving back as a staffer since 2018.